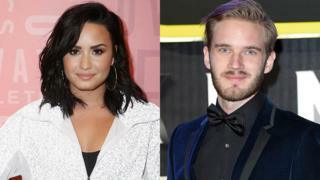 PewDiePie has apologised after posting a meme which appeared to mock Demi Lovato. The singer was being treated in hospital earlier this week after a suspected drug overdose. The controversial YouTuber deleted the post, which showed Demi asking her mum for money for a burger before spending it on heroin instead. PewDiePie says he "didn't fully know about the situation" and realised his post was "insensitive". It's thought the 28-year-old didn't make the meme himself, but instead reposted it from elsewhere. It prompted an angry reaction from Demi's fans, as well as those who support people going through addiction troubles. Demi has spoken openly about her battles with addiction, eating disorders, bipolar and depression in the past. Her fans have been sharing stories of the impact she's had on their lives by being so open. Last month Demi said she was "not sober anymore" on her new single. After her suspected overdose, a family spokesperson told the BBC: "Demi is awake and with her family who want to express thanks to everyone for the love, prayers and support." This isn't the first time PewDiePie, who has nearly 65 million YouTube subscribers, has been criticised. Last year Disney cut all ties with the Swede, whose real name is Felix Kjellberg, after several videos he released were found to contain Nazi references or anti-Semitic imagery. Then later in the year he apologised for using the "n-word" during a video live stream. "It was something that I said in the heat of the moment," he said in a YouTube post that racked up millions of views.